The Trump administration has proposed $7 billion in budget cuts to Department of Education-helmed programs, which includes slashing the entirety of the Special Olympics’ $18 million in funding. Betsy DeVos, Secretary of Education and champion of absolutely no education at all, defended those cuts on Tuesday. 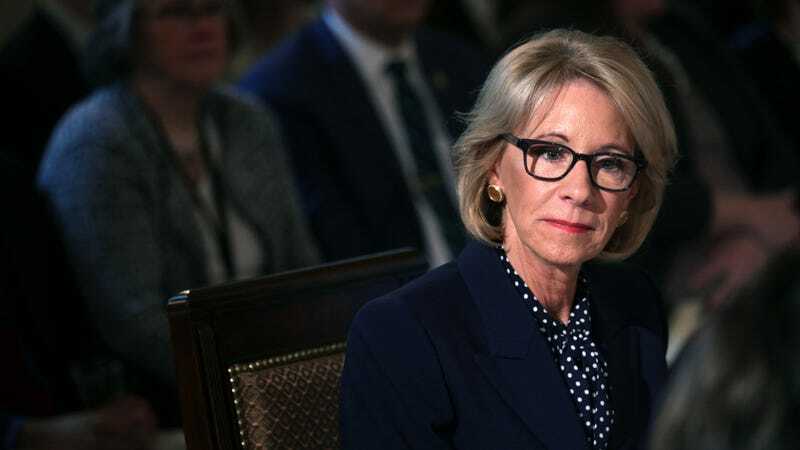 DeVos herself has repeatedly claimed that she supports the Special Olympics, and last year she donated a portion of her salary to the organization, a move she claims she will repeat again this year. That sounds very charitable, but DeVos, who is reportedly worth upwards of $1 billion, makes $199,700, according to the Hill, a portion of which will not replace $18 million in federal funding. Instead of that $18 million—in addition to $2 billion in cuts to Pell Grants and hefty cuts to after school programs and programs benefitting children with disabilities and autism—DeVos wants to allocate $60 million in funds to charter schools, her very favorite pet project. It’s unlikely the Education Department’s final budget will look much like DeVos’s proposed one. Even when the Republicans had the house, DeVos’s budget cuts didn’t make it through. And the Special Olympics, which earned about $429 million in global revenue, according to its 2017 Reach Report, would probably survive without the government’s $18 million. But the fact remains that the Trump administration is as determined to punish children with special needs as it is to erode public education. Russiagate might be a bust, but the real crimes are coming from inside the house.